Arulmigu Navaneetheswarar Tirukkoil, Sikkal – 611 108, Nagapatnam District. +91- 4365 - 245 452, 245 350. 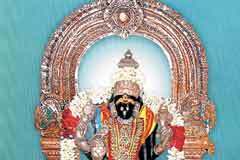 The Vinayaka of this place blesses the devotees in the name ‘Sundara Ganapathi’. Lord Muruga in the holy places, Ettukkudi, Enkan and Sikkal are alike in structure and so it is said, that these three images are sculpted by the same sculptor. On the North-western corner of the temple is a separate sanctum for Aanjaneyar. 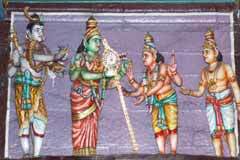 Kolavaamana Perumal : Once the devas complained about the troubles caused by Mahabali Chakravarthi of the asura clan. 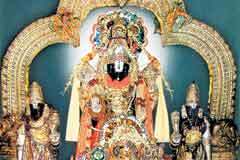 So when Lord Vishnu took Vaamana avatar, it is believed that He came to this sacred place, worshipped Lord Siva and got power to annihilate Mahabali. 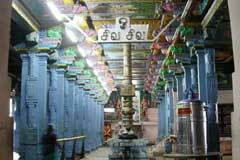 Hence, Lord Vishnu of this place blesses the devotees with the sacred name ‘Kolavaamana Perumal’ from a separate sanctum. 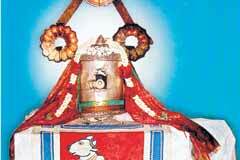 This is one of the 64 Sakthi Peetams of Amman. 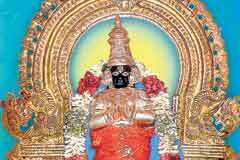 Viswaamitrar, Kaarthiyaayanar, Naaradar, Muchukunta Chakravarthi have worshipped in this holy place. 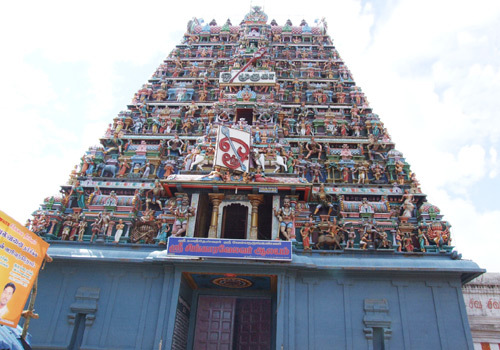 The four deities Lord Siva, Perumal, Murugan and Hanuman offering benedictions is a significant aspect of this temple. 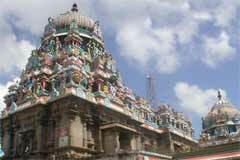 Arunagirinaathar has sung ‘Tiruppugazh’ celebrating Lord Muruga of this place. This is one of the 72 canopied temples built by Kochenkat Cholan. The devaas worshipped Lord Muruga by offering Him ‘tirisathai’ to protect their selves from the onslaught of Soorapadman. Hence, Lord Muruga put an end to Soorapadman and saved the devaas. 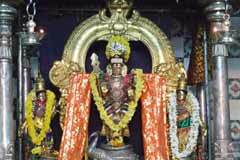 The belief is that by offering the ‘satru samhaara tiri sathai’ prayer to Lord Muruga, we will be relieved of enemies’ attack and reap benefits, since Amman has bestowed Her shakthi in the form of a Spear to Singaara Velan of this place. Sikkal is about 4kms in the Nagapatinam-Tiruvarur route.